THANKS AGAIN TO ALL YOU CRAFTY GALS for Linking up some SERIOUS FAB. CREATIVITY!!! here are some FEATURES FOR YOU ALL! SUPER “SWEET” hand made watermelon invites at 9 O’ Clock Dance of Joy HERE. Cutest E-VAH hand made intital lap tray at Paisley Passions HERE. THE CUTEST HAND painted PEEK-A-BOO shower curtain made at A Girl and A Glue Gun HERE. super super cute Button monogrammed pillow made at The Adventures of One Crazy Lady HERE. 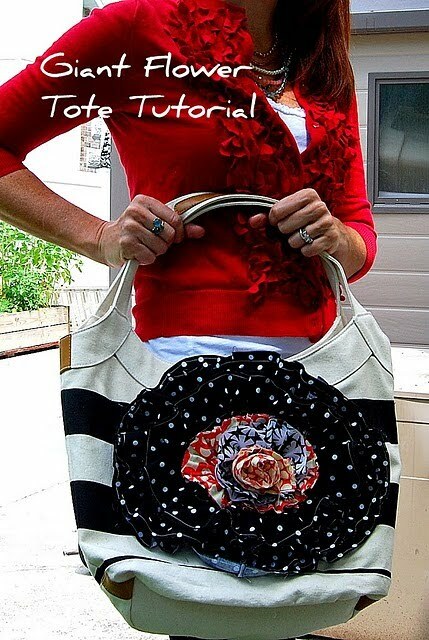 adorable GIANT flower Tote that I COVET HA! 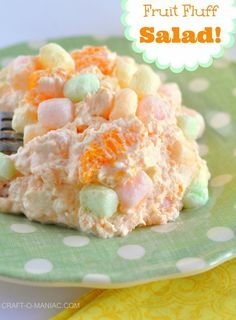 made AT Tatortots and jello HERE. 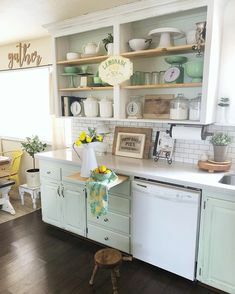 Super cute detailed table re-do at Green Gracie Home HERE. Very creative AND FUN Family Silhouette at Red Recipe Box HERE. 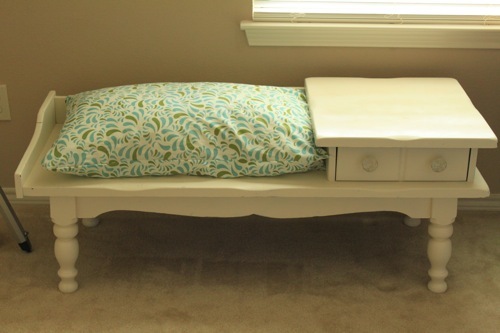 DARLING $5.00 dollar bench re-do at The Decor Chick HERE. 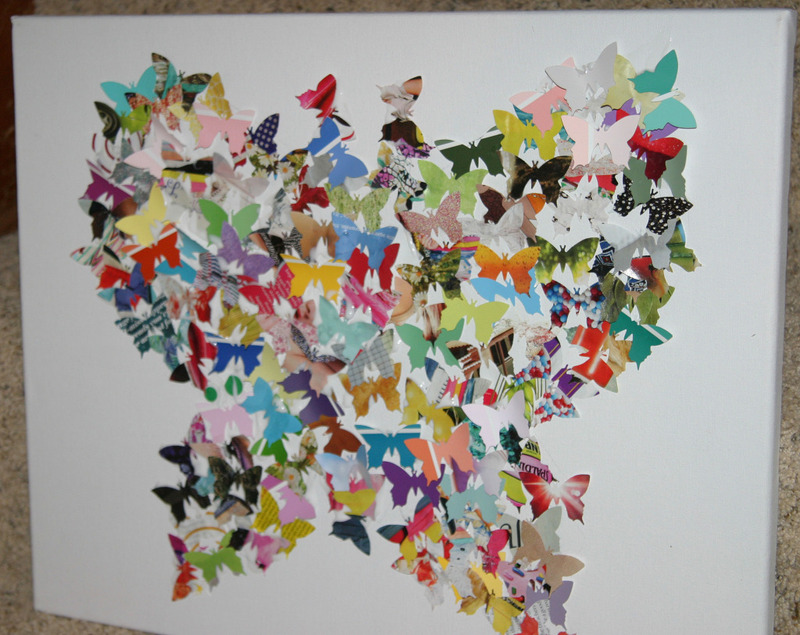 Beautiful Butterfly ART! i love this, and my little sister would too, she adores butterfly’s. You can find this at The Nifty Nest HERE. 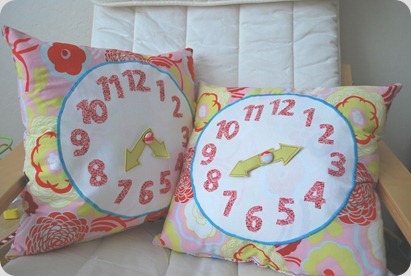 Darling Clock pillows made at Silly Precious Piggies HERE. Your kids can learn and cuddle! LOVE IT! THANK you crafters ~ GET READY FOR MORE LINKING FUN ON MONDAY! I am honored to be featured with such fantastic projects! Thanks so much! I always find the best things on your monday craft posts! :)) you rock! Thank you so much Jennie for the feature! Yay! Yes, it is such an honor to be among these talented ladies! Thank you so much, you are the best! I voted for you the other day…I hope you win! Good luck! oh wow thanks….thanks for the feature and thanks for all the other projects I just added to my to do list!!! Great Features!! I’m stopping by to say hello from NFF. have a great weekend! 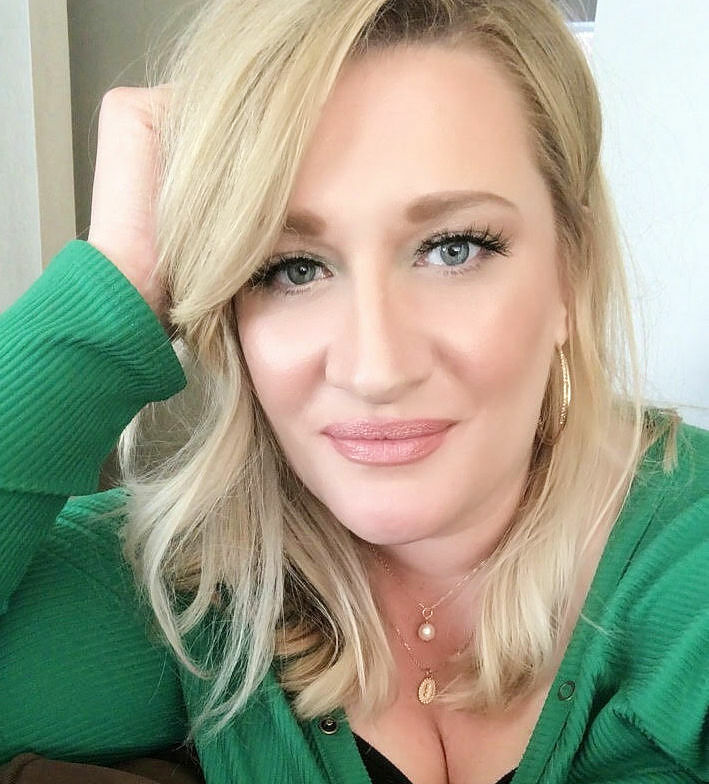 I am now following you thanks to New Friend Fridays!It would be nice if you could share the love back on my blog! Also we have the coolest blog-hop there is… no rules just fun and would love you to join in:) Oh and if you need any help tweaking your blog or easy HTML tips, you know where to come!Happy Friday! I love that you are selling your craft projects! Love the Halloween jars you have made. I love all of those great designs, thanks so much for sharing all of the wonderful projects, what a lot of hard work and dedication! I am a new follower from New Friend Friday, so glad to have found your blog. Hope you have a wonderful weekend! What great projects! I must go visit some of those blogs too! Thanks for sharing!!! What fun links Jenn! I am off to check them out. Thanks for featuring my tote! you WON a little treat on our giveaway. come check it out. email us your addy so we know where to send it! These are such cute ideas! I love the table with the “w” legs! Hi I am visitng from NFF.. I have subscribed to your blog. It’s full of info. As a new crafter I need all the help I can get LOL! I want these! These are super cute!! !